Use your smarts to help your TiViTz avatar make and solve math problems! Score as quickly as you can by jumping your opponent, using strategy to score the highest goals and making sure your challenger did their math problems correctly. Strategize your way to victory today! Play online or download our app from iTunes or Google Play to play TiViTz on your tablet or smartphone! The best-selling board game version is available in our online store. A nationwide favorite of parents, teachers and kids, the TiViTz board game is the winner of numerous awards, including National Parenting Center, Creative Child and Parents’ Choice. 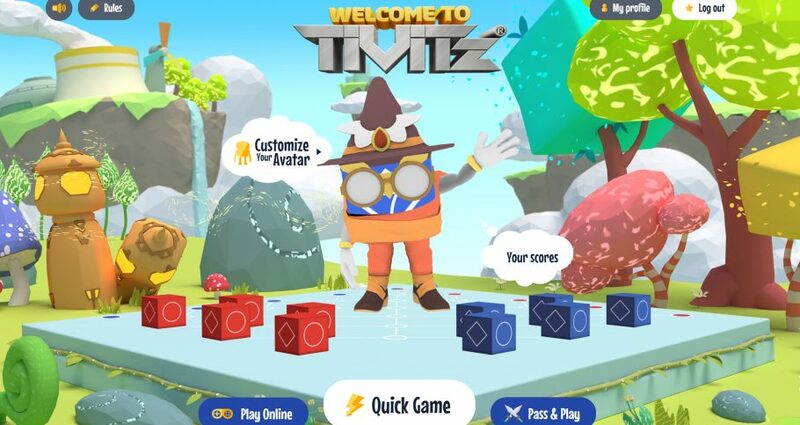 No matter what level they play, more than 700,000 students and more than 14,000 teachers agree — TiViTz makes math FUN! The object of TiViTz is to race your opponent across the field and create math problems by combining your numbered game pieces with the other half of a math problem located on the score goals. Maximize your score by producing math problems with the highest possible answers. The player with highest TOTAL score wins! Red moves first. Blue gets the last move. You may jump or multi-jump either game piece without removing the jumped game piece. You cannot pass a move if you have a legal move available. The score goal in center field is a shared score goal, that is, first-come, first-score. Game Over: The game is over when one player captures ALL four score goals AND the “common” score goal has been captured by either player. Only the game piece on score goals when the game is over are used in calculating the score. Solve the math problems and type the answers into your score sheet. Compare your score to your opponent’s score. The highest total score wins. A force-jump is not only a great way to irritate your opponents and make them move in a direction they didn’t plan to go, but it also forces your opponent to forfeit a turn. A player must move or jump a game piece onto an empty space directly in front of a game piece of the other player and call “force-jump.” The other player must then jump as directed. Players may be force-jumped onto their own score goals, but a player’s game piece may not be force-jumped onto the other player’s dugout or score goals. Remember: No game piece can ever be force-jumped backward. A player who is force-jumped loses a turn. Just like in checkers, you can use your game pieces to block your opponent’s pieces from moving forward or from landing on a score goal. For instance, it is legal to leave your game pieces in a position that blocks your opponent’s piece as long as you have other legal moves available. A player may force-jump an opponent’s game piece onto a fly-out space. The opponent must return that game piece to the start position. A player may elect to move or jump his own game piece onto a fly-out position without a penalty. Surround your opponent’s game pieces inside his dugout to prevent him from moving and/or scoring. It is legal to trap the other player’s game pieces while sacrificing the movement of your own pieces as long as you have other legal moves available. In the board game, some players prefer to arrange their highest numbered game pieces on the back row and come out jumping. Some players like to keep them in the front row then jump them to form a protective wall. TiViTz is all about strategy! Moving across the board quickly helps you capture the common score goal. Always look for opportunities to jump or multi-jump your own or your opponent’s game pieces across the board. Defensive moves like blocking and trapping can prevent your opponent from scoring. A force-jump forces your opponent to forfeit a turn. Unlock dozens of new achievement badges!